Roads, railroads, and river transportation are essential components of economic growth through the movement of goods, services, and people. Modern economic systems are dependent on the efficient movement of goods, services, and people. You can learn about an economic system by studying its transportation system. Take a look at the map of the colonially developed rail system in Africa. Railways were an important method of transporting goods and people in Africa. Although Africa has many great rivers, rapids and waterfalls make many of these rivers unsuitable for long-distance transportation. Consequently, colonial governments and commercial companies sponsored the development of railroads as a primary method of transporting agricultural and mineral resources. 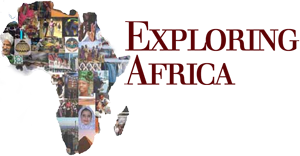 Study the map of Africa’s Railroads. 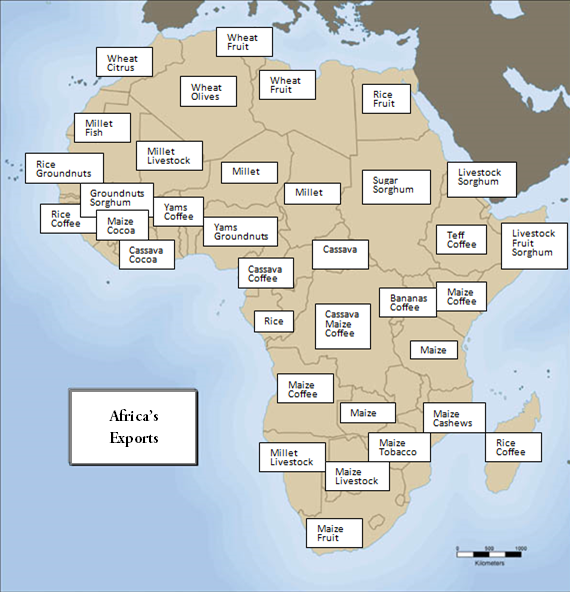 While studying this map look at the map on Africa’s exports during the colonial era. Using the information provided in these two maps and what you have learned in this and previous lessons, try to answer the following questions. Write your answers on a piece of paper, and then share your answers with your teacher. Looking at the railroad map, what can you conclude about railroad development in Africa? What region(s) has the most developed rail system? Why do you think this region has the most developed rail system? What region(s) have the least developed rail system? Why do you think these regions lacked rail development? What products needed rail-roads for movement? If you were a transportation planner, in what other areas in Africa would you build railroads? Are there alternatives to rail transport that might be more economical? Give reasons for your answer.